The Waikiki Sunset sits on a tranquil side street, not more than a block and a half from Waikiki Beach. With a host of hotel features that appeal to children and adults, as well as a location close to all the dining, shopping and recreation of Waikiki this condo resort complex is a favorite among vacationers. 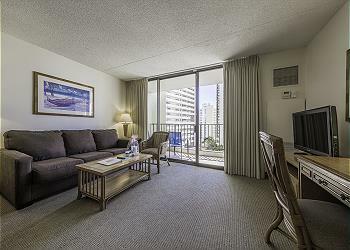 Amenities of the Waikiki Sunset, built in 1979, include central air conditioning, a heated swimming pool, lighted tennis court, sauna, picnic and barbecue areas. Beachgoers can easily rent lounge chairs, towels and other necessities from the onsite sundry store, making a trip to the beach hassle free. Security includes hotel staff and private guards. It is possible to bring pets, but approval is required beforehand. One and two bedroom condos are offered, all designed and decorated for a comfortable beach lifestyle. Fully equipped kitchens make picnic or dinner preparations easy, even if you are a larger family. The private lanai of each condo allows you to unwind to views of the beaches and ocean, the misty rainforest mountains or the bright lights of Honolulu. Those who stay at Waikiki Sunset have plenty of activities to pursue including snorkeling, surfing and swimming. 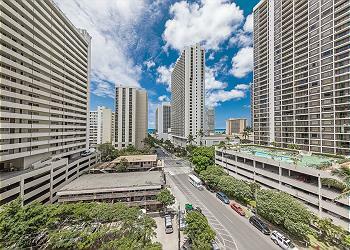 For days away from the beach, everything from museums to the Honolulu Zoo is minutes away by car.